... to you all! Hope your loved ones spoil you all day long! Ali and I haven't swapped cards yet as he left for training at 6am this morning. I've got his stuff all ready to go but I fear I'm not going to be quite so lucky... His final words to me last night before going to sleep were "Please don't be mad at me tomorrow - the weekend snuck up on me quicker than I thought it would...." Oh well, a last minute card and some flowers picked up from Tesco's Express on his way back from training are better than nothing aren't they?! At least we are spending the day together and are having a nice dinner tonight (Mexican - yum! ), thats the most important thing after all. What did I get him? Well, I found this great website called Cocoapod where you can personalise chocolate! As he adores white chocolate, I used their build-a-bar service to create a completely white bar with his name on it. Such a fab website! I wrapped my bar in some brown parcel paper which I stamped with a red heart stamp. It looks really good, so I'm happy. Anyway, onto my card. I decided to make a gatefold card as this is something a little bit different for me. However, because of that, I'm not quite sure how successful it is....! And whilst I really love this downloaded paper, and in fact all downloaded paper, the final effect never quite looks as professional and glossy as when you use pre-printed manufactured paper. Do you also find that or is that just me?! Stamps: Pink Cat Studio - Sweethearts. Paper: Digi download from here. Ink & Colour: Memento (Tuxedo Black) and Copics. Embellishments: Hobbycraft adhesive gems, Sizzix photo corners and ribbon from stash. Enough of my rambling, enjoy your day! Great card Stacey. Great image, I like making gatefold cards, just as long as they meet ok in the middle! Know what you mean about downloaded papers - they're just not the same. Looking forward to Monday, c ya then. personalized white chocolate? that just sounds delish!!! 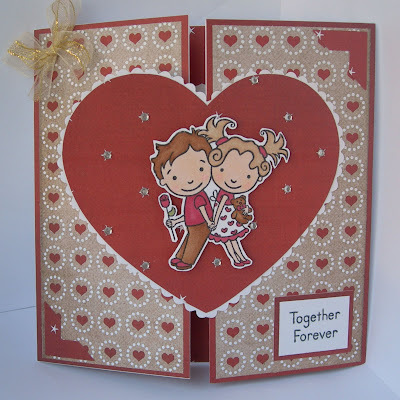 SWEET gate fold card..I'm just getting into the downloaded mode...I think your card looks and photographed beautifully :) Happy ♥ day!!! Stacey this is fabulous honey!! Love the gatefold and the sweet image. personalized chocolate? That sounds so fun! Love the card--sweet image and paper! Have a great weekend! Great card Stacey! Lovely colours and I've never downlaoded papers as we don't have a great printer :( But maybe now I've heard what you've said I'm not missing too much! Gorgeous card, really cute image & lovely papers. Hello Stacey, I love the sweet boy and girl image and I love the saying. Great card Stacey, I think I might copy your idea and do a few Gatefolds,bit different!!! I know exactly what you mean about Downloaded papers,you just cant beat a new crisp,fresh 12x 12 paper book in my opinion!!!!! Georgeous card ad also love the paper you have used. The image is very cute too. Gorgeous card ... what a lovely image...I agree about the papers.